I have the great pleasure of introducing to you Nancy Adams. 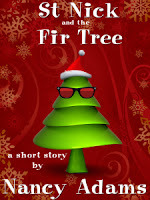 Today's guest blog is part of her tour promoting her Christmas short story Saint Nick and the Fir Tree , which has just come out in both ebook and print formats (http://nancyadamsfiction.com). It looks like it would make an excellent gift exchange party gift for those looking for that last minute item. My earliest Christmas book memories center on The Animals' Merry Christmas written by Kathryn Jackson and illustrated by Richard Scarry. It's been years since I've read the book or even thought about it, and I can't recall any specifics about the stories. But just looking at the pictures that came up when I searched for it on the Internet preparing for this post gave me a warm fuzzy feeling. I see that the publisher's reissued it, and I think I'm going to reissue it, too, and give it to myself for Christmas this year. My sister has the copy we grew up with because she's the one with a kid, my wonderful nephew Sam. 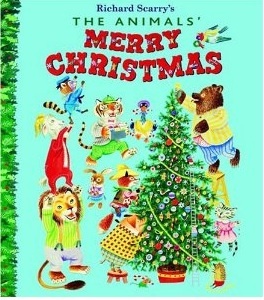 I'm glad The Animals' Merry Christmas is being passed down to the younger generation. When I grew a little older, I loved looking through the Christmas issues of the Ideal magazines our mother collected. I don't know whether the magazine is still published, but she had a whole stack of them. The issue I liked best had several pages devoted to the celebrations of Christmas in different lands. It included information on feast days that seemed wonderfully exotic to a girl growing up in the white-bread, Protestant suburban Midwest. 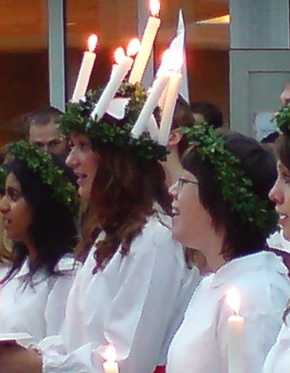 There was December 6, St. Nicholas Day, and December 13, when Scandinavians celebrated the Feast of St. Lucia. The accompanying picture showed a young woman wearing a circlet of lit candles on her head, something that stuck in my memory. Today my first thought is to wonder whether any of the candle wearers ever set her hair on fire. The notion never entered my head back then. Ah me, how our mindset changes once we've grown up! Around the age of thirteen or fourteen I became a huge Charles Dickens fan. I'm sure it began with his A Christmas Carol, which I acquired through a children's classic book club that sent nice little hardbound editions of classics once a month or so. It included his other Christmas stories, but A Christmas Carol is deservedly the most famous. I think reading it was the beginning of my fascination with language. It was the first book where I was conscious of enjoying the language, enjoying the way Dickens played with it, reveled in it, as much as I enjoyed the story he told. I'm still a huge Dickens fan. 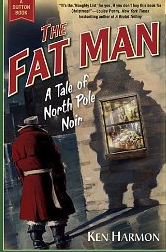 Last year I added a new book to my Christmas pantheon with Ken Harmon's The Fat Man: a tale of North Pole Noir. I won it in a blog giveaway, started reading, and couldn't stop laughing. I wound up giving it to everybody I knew. If you like the noir classics of Raymond Chandler and like a good pun, you'll love the comic "noir" tone of the first-person narrator: an elf on the outs named Gumdrop Coal. This year I'm curious about two. The Man in the Cinder Clouds by Rick Daley, described as "an origins-of-Santa story" and Tim Greaton's The Santa Shop, described as "a homeless man's journey from despair back to life and Christmas"--both discovered via Twitter. And finally, my own modest contribution to the genre: "Saint Nick and the Fir Tree : a short story of the day after Christmas." I should first say that it's not a children's story, but aimed more at adults. The idea came to me one summer's day when I'd gone out to prune a yew bush in our yard that the previous owner had shaped like a little fir tree. With the new summer growth, the yew looked like a Christmas tree gone punk--little light-green spikes sticking out all over the place. Once I'd taken care of those, I stepped back to examine the overall shape. Instead of a nice, smooth cone, the middle had become rather bulgy, as if the "tree" had grown a little beer belly. Instantly my imagination kicked into gear. How would a tree indulge? I thought of the Ent draft that Tolkien's Treebeard had given the young hobbits. I thought of the yew's Christmas-tree shape. What if old Saint Nick had come to town and given the tree a flask of Ent draft? What would it be like if he took his new Tree buddy out on the town, to a Jimmy-Stewart kind of tavern? 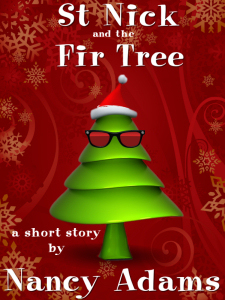 Et voila, "Saint Nick and the Fir Tree" was born. About Nancy Adams: A freelance editor and theological librarian, Nancy writes mysteries and fantasy. Her short story "The Secret of the Red Mullet" is published in FISH TALES: the Guppy Anthology. She is a member of Sisters in Crime and Mystery Writers of America. In her spare time, Nancy reads, sleeps, and whacks the occasional dust bunny. For more about Nancy and her works visit http://nancyadamsfiction.com. Nancy has been so kind to offer 2 of my readers a copy of "Saint Nick and the Fir Tree". For US & Canada readers you can win a print copy and for my international readers you can win a ebook. While I would love for you to follow my blog, sign up for my newsletter, or join me on Twitter, none of that is required. All I need you to do to enter is leave a comment, a way to contact you should you win, and your country. I'll do 2 different drawings using Random.org on 8 pm EST Tuesday Dec. 20 to choose the winners. Like Nancy, I love Christmas books. One I treasure greatly was given to me by my sister - Norman Rockwell's Christmas Book: Carol and stories, poems, recollections. What are you favorite Christmas books?